Hey, today is Children’s Day in Indonesia! It’s July 23. How was your childhood? Mine was fun. 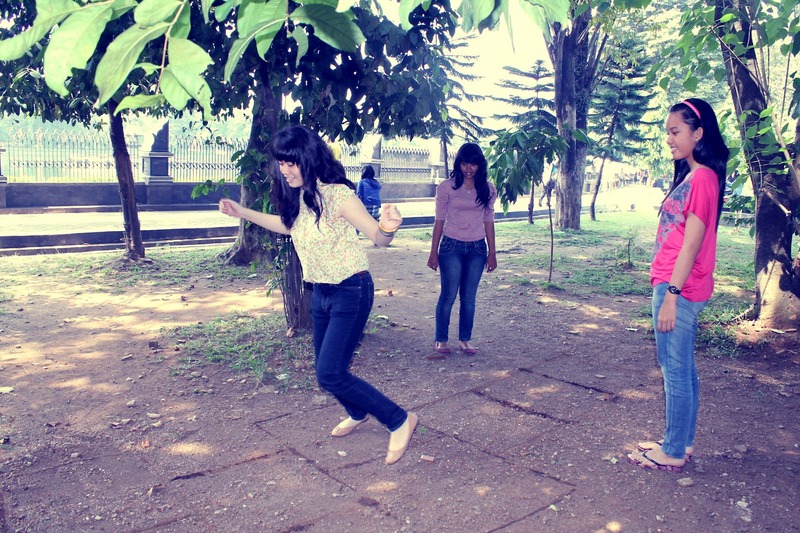 We played a lot of fun traditional games back then. Yes, games! It’s unavoidable when we are speaking about children. But you know what, children in Indonesia today don’t want any old-schools. To play a game, they prefer the electronic games, rather than traditional ones. They love to play games on website, PCs, consoles, smartphones, or tabs. 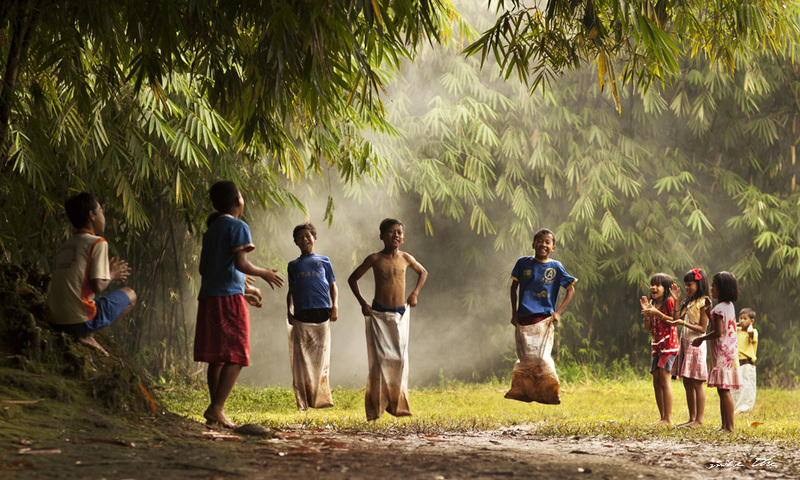 Sophisticated games are easier to get and aren’t so expensive anymore in Indonesia. It makes us forget that, once upon a time, we had more interesting toys and entertainment. We were more social and sporty those days. The toys were more simple, cheaper, yet fun. I remember when my father gave a hand-made AK-47 and a sword of wood. We, about 4-5 lads, started the combat by those weapons. I also recall some non military games during my childhood. The games that very few children of today generation play. Here they are…. This game is as simple as putting your feet in the gunnysack then jumping forward or just walking fast towards the finish line. 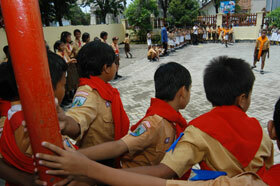 Balap karung is usually held during the celebration of Indonesian independent day. It’s superfun, specially when each player has some “fanatic” supporters. When the game begins, the biji bekel (jacks) are all held in the hand of the player and are dropped as the ball is bouncing once. The player then starts to play by picking up the biji bekel one at a time without disturbing any of the other biji bekel. Then she throws again the ball and pick up the other biji bekel. She must repeat this until all the biji bekel are picked up. Next, the player must do the same way as the first step, but this time she must pick two biji bekels at a time. After the second set is finished, she repeats the game (or do the third set), by picking up three biji bekels. Then, she must pick all the biji bekel with one sweep of the hand. It’s not over yet. She drops all the jacks again and starts the roh (upper part of the jack). The player must attempt to turn over all the biji bekel so the roh side is facing up. If this set is finished, in the next set she must turn the biji bekel so they become facing downward. The winner of bekel game is the player who have done it all perfectly and faster. Your team can also win by capturing all of the other team’s players by touching their body (when they are not connected/touched with their fortress). The interesting part is, you can also get captured if they touch you when you are outside your fortress. How if you and your opponent touch each other? Who would be the hostage? Here’s the key, the fortress is your source of power. When did the last time you touch your fortress? If it was 60 seconds ago, while your opponent did it 30 seconds ago, then it means he has more power. If you touch each other, you should be the hostage. According the game rule, you’ll be stand near their fortress as prisoner. Don’t worry, your friends can set you free by touching you. But since it’s your enemy’s territory, it would be a dangerous mission for your men. Hence, bentengan is like a special force game. You have no chance to win if your opponents are very good in running, team work, strategy, tactic, and provocation (teasing your team to come out from the fortress). That’s why, this was my favorite traditional game during my childhood. Dakon is played on a board with circular indentations along both sides and a home indentation on each end of the board. The game started when the two players pick the biji bekel from right end hole and fill other holes one by one until they reach each other “mother” (the big hole in the left of the board). Then, the player is free to pick the hole and fill other holes. Just remember, the player’s hand must move to the left, and they must fill each other “mother” everytime they play. If a player has run out biji bekel and the last drops on the hole of other player’s side, it means she loses. To play again, she must wait until the other player loses. The same case when she drops the last biji bekel on her side and there are no biji bekel in front of the hole in which the last biji bekel is dropped. However, if the last biji bekel drops on the “mother”, she can continue the game. What if the last biji bekel is dropped in our side and there is biji bekel in front of the hole? It means, we have “shot”. We can pick our last biji bekel plus the biji bekel in the hole we have “shot” and put it all in our “mother”. The winner can be seen by knowing how much biji bekel on her “mother”. We don’t have to count one by one. Just fill back the holes. If we have more biji bekel, we are the winner. We aren’t so sure about where egrang came from. Even in Europe, we can find this tools with other purpose. However, people in West Sumatra recognize egrang as tengkak-tengkak (cripple), Bengkulu know it as ingkau (bamboo shoes), Central Java identify it as jangkungan (branch of wood where birds lean on), and batungkau in South Borneo. The word “egrang” alone came from Lampung language, which means clog that was made from bamboo. Egrang is made from bamboo with approximately 2.5 meters long. Around 50 cm from the bottom, we put a place to stand on. Not only to see something from higher eyes, in Indonesia, we race the stilt users back and forth. You need to step forward quickly while maintaining your balance to win this game. Engkle can be found in Indonesian regions, such as Sumatra, Java, Bali, Borneo and Sulawesi. It’s a simple game. Just jump on one leg on each squares has been drew on the ground. Every player should have kereweng or gaco. It’s usually a broken tile, ceramic floor, or a flat stone. The gaco thrown to one square, then pass though on each square with one leg. If it suits the square, the player can step with two legs, while the other players can’t step on it during the game. Participants who have a “field” at the most is the winner. In France, gobak sodor is like passé murail game. It is a a game of two teams, which consist of 3-5 players. One team needs to pass the final “wall”. In fact, that wall is a line. Each line is guarded by the players of opponent team. They win when all the member has passed the last line. For the opponent team, the mission is to fail the penetration of playing team by catching him or simply touch him. Of course, without his own foot off the line. Gobak sodor (might be from English “go back to the door”) needs only 9 x 4 meters square. 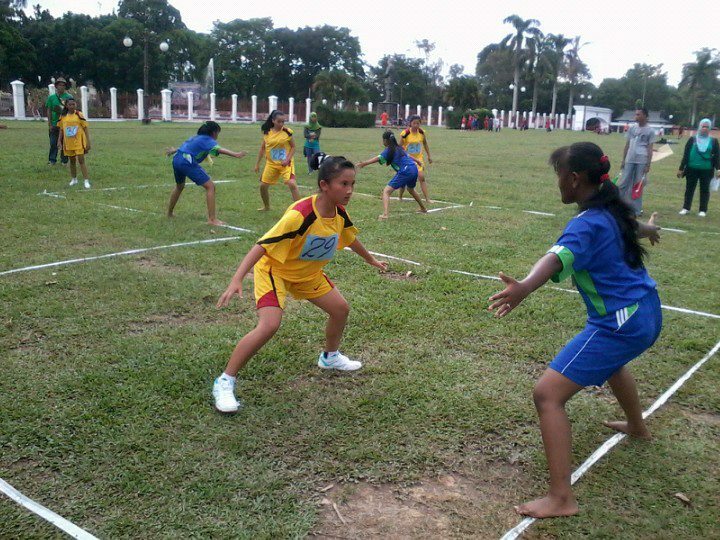 We used to play this in the field of badminton or volley ball. But sometimes we created also the lines on the ground. You’ll need physical speed (to penetrate), body flexibility and reflex (to avoid getting touched), as well as team work (strategy of distraction in order to give your front partner chance to pass the wall) to win this game. Then we fight each other’s gasing. Normally, a 50 cm diameter of circle is drawn on the ground. The gasings are spun to start the battle. The objective of this game is to knock your opponent’s gasing out of the circle. If they don’t hit each other, the winner is the player whose gasing stands last. There are many variations of kelereng game. One of them is The Circle. First, you must draw a small circle on the ground. All the players put one of their kelereng within the circle. Then, each of them throw another kelereng to a point outside of the drawn circle. The player whose kelereng is furthest from the circle play first. He will use his kelereng from his last position to hit the pooled marbles until they spread outside the circle. His kelereng has to be outside of the circle too. If he succeed, he can own all those marbles. Then, he can continue to hit his opponents’ kelereng in order to owning those marbles too. But if the he fails to strike all of the marbles, or his own marble is trapped within the circle, the other player (second furthest from the circle) will take a turn. The strategy of this game is like is billiard: good shooting skill and targeting priority. This is a very popular game that elementary school pupils used to play during the recess. The rope that the girls use is made from hundreds of elastic bands that are looped together. The girls then take turns jumping over the rope that is held by two girls at each ends. The height of the rope starts as the ankle level. They gradually raise the rope each time the jumpers have success hop over it. The experienced players can even jump over the ropes that are neck level! But don’t worry if she fail. That’s the advantage of rubber ropes. It won’t hurt the players. However, you’ll need a bravery and a lot of practice to be the best jumper. Prepare two wood sticks, which are about 30 cm and 15 cm long. The players are spare into two groups. Then, first player in the first team plays. You hold the longer stick like a sword. Put the shorter one between two stones. Pry up the short stick by your longer stick. When the shorter floating in the air, hit it until that stick is flung as far as possible. Your opponent will count the distance from the point it falls to your hitting area, with that stick (not with the tape measure). That is your point. Let’s say 100. But wait! If after you pried up the short stick, you did actually the small two hits (juggle) before the final bang, your point will be twice (200). You juggle it with thrice hits before it went away, you’ll get 3 x 100 or 300 point in final. However, when you fail to hit the short stick out of your hitting area, you get no point. Same case when your short stick get caught by the opponent player. You end and it’s your friend’s turn. After all your friends in the team took a turn, then your opponent team’s turn. The higher point team is the winner. I don’t think you never heard this popular game before. 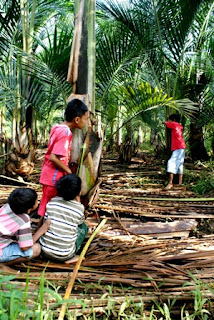 Petak umpet is like any other hide-and-seek game played in many countries. The game is played by at least two players. A player chosen to be “it”. She has to close her eyes by facing a wall or a tree as a base, than give her other players chance to hide by counting up to 10 or 20. Then, she attempts to locate all concealed players. The game ends when the player chosen as “it” locates all players and says, “Skit!” or “Inglo!” or “Bon!” or “Hong!” But when any player can touch the base without the “it” notices, every players she has discover must be freed. And she has to start over again. The player found last is the winner, and the first one (unless he is freed) is the next “it”. That’s all I can remember. 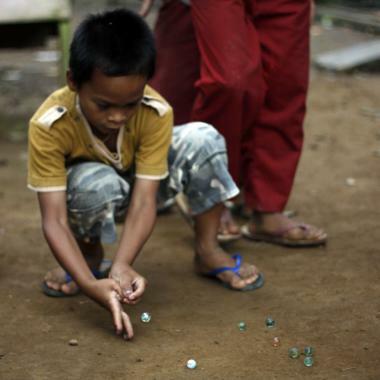 I will add the other traditional games of Indonesia when I recall. I remember all of them, and don’t forget kite, catapult, wooden harpoon, and ular-naga-panjang. selalu rindu masa” kecil seperti ini. jauh dari tablet dan komputer zaman sd dulu. tak benteng, tak umpet, tak jongkok, batu tujuh, dan lain macam kegiatan menyenangkan! Hi, Anne. As far I know, Indonesia don’t have any game called Upin-Ipin. FYI, Upin and Ipin is a fictitious characters of Malaysian animation. From your description, I think the nearest game might be Patil Lele. Is it? i wan a copy of this article, how can i get it? I don’t forget dakon..engklk,,,delikan.. hahahahaa…..